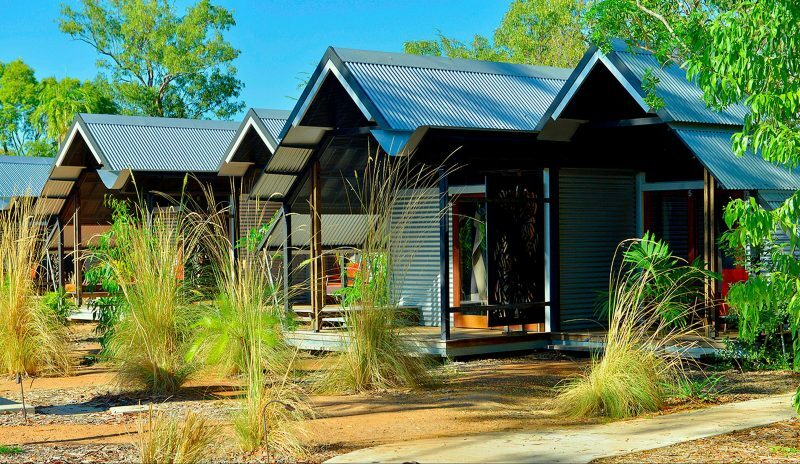 Anbinik Kakadu Resort offers guests award winning architecturally designed accommodation in Jabiru, central to most of Kakadu National Park’s icon attractions. 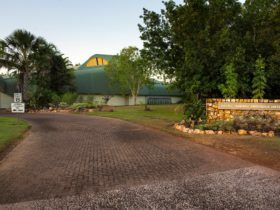 Set in tranquil tropical surroundings it is within walking distance of the local restaurants, supermarket, Jabiru Town Plaza and the Bowali Visitor Centre. Anbinik offers a range of accommodation styles – its famous bush bungalows, air-conditioned double rooms, spacious two bedroom cabins & our Anbinik suites new with indoor outdoor bathrooms and powered van sites with own ensuite. Tea and coffee making facilities, fridge and cooking equipment are all available. Facilities include pool, seasonal cafe, guest laundromats, barbeques and a tour desk. 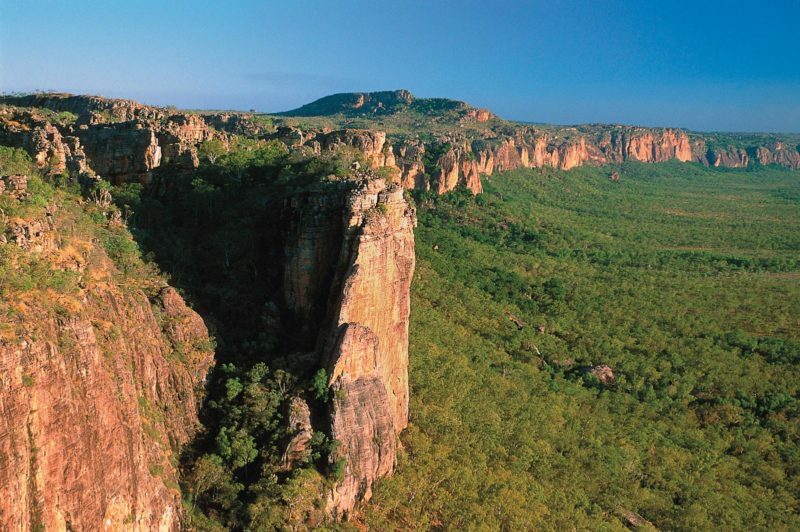 Ask about our packages that can include an Arnhemlander 4wd day tour and a Guluyambi Cultural Cruise. 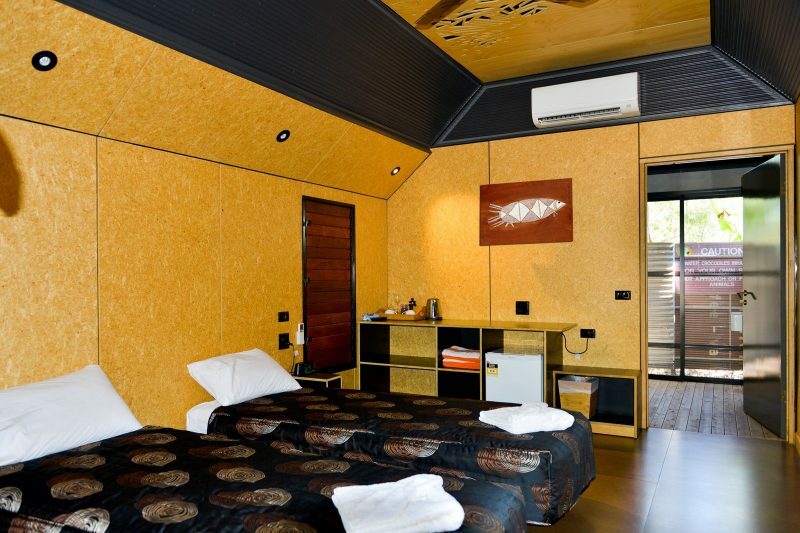 These are spacious two bedroom self-contained cabins that offer the option of airconditioning an natural ventilation via banks of cedar louvres and ceiling fans. With bedding combinations to suit your needs, for example two double beds and a single bed or one double and three single beds catering to up to five people. Some cabins have balconies. The bush bungalows are unique safari style structures catering for up to four people. Designed for the environment, they are set up off the ground and are well ventilated with ceilings fans. Each bungalow is set among a lush, tropical garden setting and are furnished with a double bed and a bunk bed or three single beds (which includes a bunk bed). The double rooms are six private double rooms, all under one roof with a communal kitchen area and caters for up to two people. Each room offers the option of airconditioning and natural ventilation via banks of cedar louvres and ceiling fans. These rooms are perfect for extended families or travelling groups. Individual rooms are furnished with either a double bed or two single beds. The Anbinik Suites are our recent additions to our accommodation range. Our Anbinik Suites are, award winning designed, which captures the essence of our location, within Kakadu National Park. We have 14 Anbinik Suites, 4 with Disabled access, allowing the benefit of both indoor and outdoor showers, within the ensuites. These Suites can also be configured to 2 x singles, when required. The option of air-conditioning, fan or natural breeze. Surround by natural lush tropical vegetation, which can be enjoyed from your outdoor day bed on your private verandah. You will also enjoy fridge, TV, and coffee and tea making facilities. Parking is provided at the rear of your Anbinik Suite. 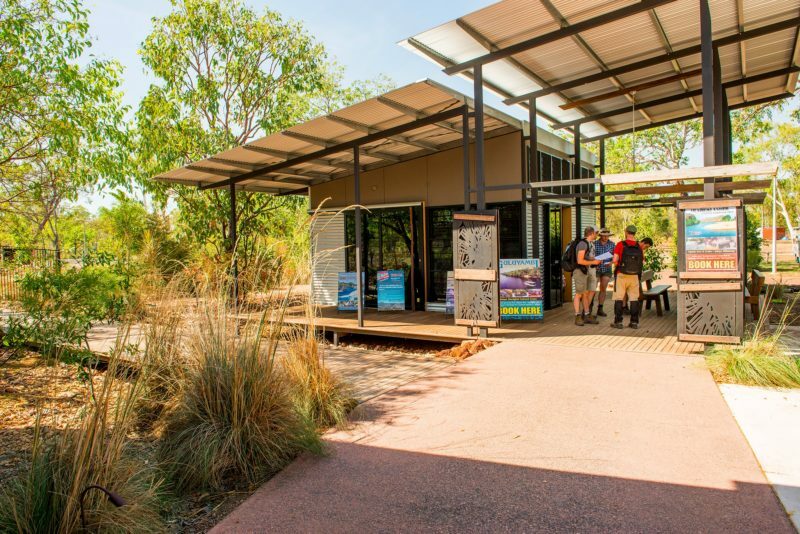 Lakeview Park Kakadu has the only ensuite van sites available in Kakadu National Park. The sites consist of your own concrete slab for annexes and connection to electricity, toilet and shower. $250 for spacious two bedroom self contained cabin for up to 5 pax.